Google has been rolling out some nice updates to Google Sites and while everyone is "a-twitter" about mobile render of Google Sites there's also some lesser recognized updates. I found out this little button appeared on my drop-down bar for More Actions and basically I've been accidentally clicking it instead of Manage Site (Picture 1). Anyways, let's explore this. Click the button and you taken to a redesigned Adsense page just for Google Sites. 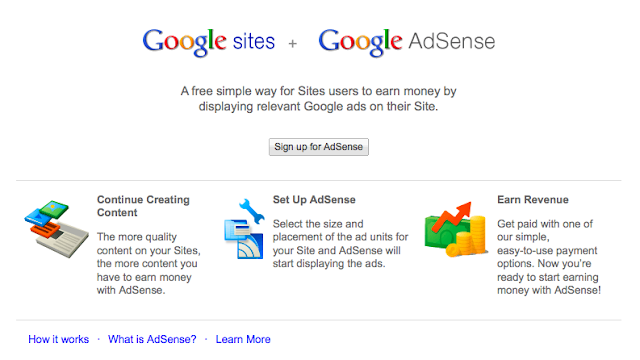 Google is encouraging Google Sites designers to use Adsense. Obviously intranet / project management Sites are not intended to be breeding grounds for Ads, therefore Google is implying that public Google Sites should be using their Ads. If Google wants to make money, it stands to reason that they want to make Google Sites better for web designers. My conclusion? 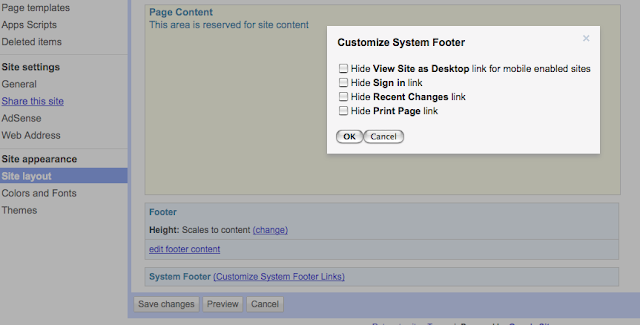 Google Sites will continue to improve as a platform for public websites. 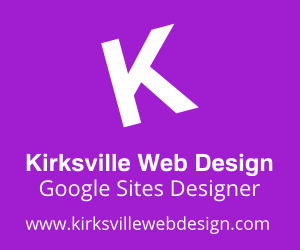 Our first evidence of this is mobile rendering of Google Sites. Just a little button can mean so much. It has been nice that Google Sites has been unobtrusive for the most part, limiting their required links to the very bottom of the page in small font. However, those links can give visitors the wrong idea thinking they can sign in to your website. Public websites are again being highlighted here with this update. If anything those links are nice for private users. 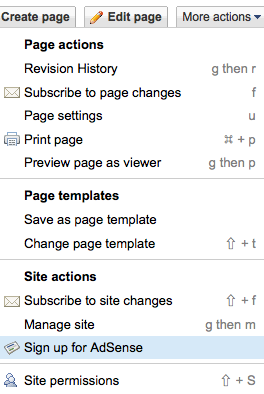 Now you limit the footer links to "Terms" "Report Abuse" and "Powered by Google Sites" - not bad. That was nice of Google. I have not been able to really experience this. It is still a beast to even attempt to edit a Google Sites on my Ipad 2. I don't have a Droid or iPhone, so if a visitor can enlighten us on the impact of this update, please comment.